Is there anything better than waking up to sunshine through a nearby window? Or reading a book in a sunroom? If you have forgotten the feeling, you are not alone! All over Olds, windows are being coated with dirt and debris and are barely letting any light inside. When you are looking to manage your heating, lighting and comfort, our Olds window cleaning is a good place to start! The most common treatment for a dirty window is to grab a rag or paper towel and approach stains with blue cleaner. Standard glass cleaners might provide a quick-fix but it is not an effective one. 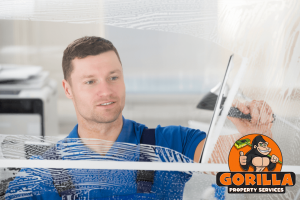 These cleaners can be harsh on your glass and the surrounding areas like frames and sills. 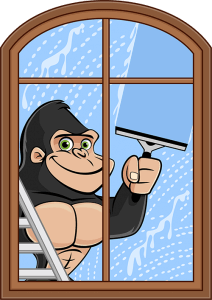 Instead of taking a chance on sub-par results, let our Gorillas treat your windows right. When you wipe down windows side to side, this friction creates a static charge that attracts airborne material. This leaves windows looking dirty as soon as you are done cleaning them. What could be more irritating than that? Instead of taking on a futile chore, ask a Gorilla to get it right! The key to a proper Olds window cleaning is the right tools and technique. By using rubber tools and eco-friendly cleansers, our Gorillas are able to get the best results without the static charge. When you have windows on the upper layers of your space, our Gorillas are able to reach glass, frames and sills by using water-fed poles. Nothing under four storeys is out of our reach! The condition of your windows can affect your bills, comfort and lighting, so why not get the best results possible?